According to NAR, every year about 8% (400K - 500K) homes are sold by owner (FSBO) with many more starting as a "For Sale by Owner" but eventually listing with a real estate agent. This creates opportunities to generate real estate leads. Mortgage lenders and real estate agents can leverage CallAction to approach sellers with some of the marketing and a FSBO kit with the primary goal of generating real estate leads and seller listing referrals. The goal is to create a win / win scenario for both you and the FSBO. The average for sale by owner homeowner struggles with the following items according to NAR survery data. The moment a FSBO seller post their home for sale by owner they will get tons of calls from agents, investors and home buyers as their contact info will be scraped and aggregated and sold. Your offer to help them keep their phone number private by giving them a CallAction phone to use in all of their marketing to avoid the pain of people contacting them to list their home even after their home has been sold. You may choose much or as little involved beyond the solving this primary pain point. Mortgage Lenders: you will identify real estate agents to work with (the ones calling on the FSBO), generate buyers to prequalify and if home does not sell have listings to give back to your real estate agents. You can help FSBO in a few ways depending on how involved your like to be in the process. A) Provide signage & call capture number that is forwarded to the for sale by owner. Calls are forwarded directly to the owner of the home to let them speak with buyers, agents, etc. You give them account and can This is minimal effort and involvement. B) Provide full marketing, call capture to qualify the inbound leads. This is more effort but you will convert the sellers into listings at a higher rate because you'll have more trust & rapport established. Here are some ways to find FSBO’s in your areas. Items your should include in your For Sale by Owner Kit. 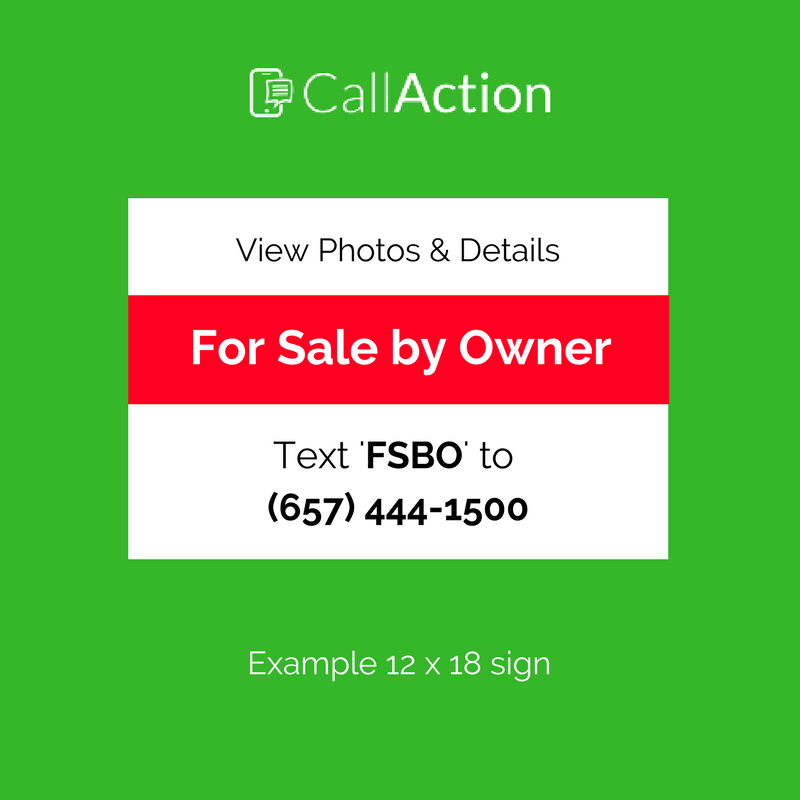 Add a new dedicated CallAction phone number to the FSBO sellers marketing. 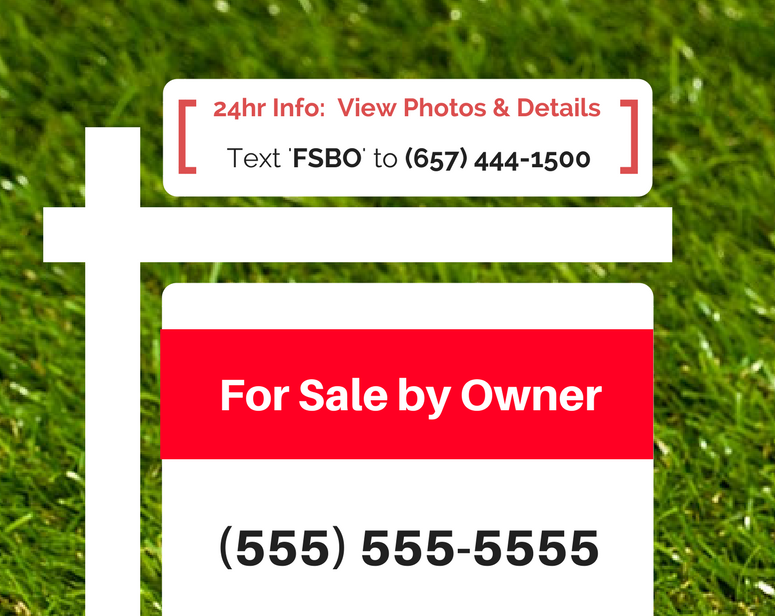 Create a full size FSBO signs w/ a CallAction call capture phone number to give to consumer. Provide a "Text for Info" sign rider to capture leads and identify neighbors who maybe possibly selling in the near future. Use the text for info sign riders to generate both leads from buyers but also nearby sellers who will text to learn what their neighbor is selling their home for (review details below. Since you may not have ability to create a website for the FSBO, you can create flyers with photos & maybe link to video tours. Setup the text tool to allow users to request property flyers. Upload PDF to any free online storage like Google Drive, Dropbox or One Drive. Activate a CallAction number as a text tool with these instructions. Setup a simple "Key" that is also printed on sign rider for users to request info. Setup response with property details, size, bed, bath, price & link to the flyer. If you have video, you can also include link to the video. Now, anyone driving by can request info about the property without disturbing the owner was is a value proposition for them. CallAction does real-time reverse data append and attempts to locate the address and property details of anyone who calls or texts. As people text for info, simply review the captured info. If you notice that an owner nearby requested the info, check the appended data to see if the user owns a home and how long ago they purchased. If 3 or more years, they maybe thinking of selling in the future. If you are interested in generating real estate leads by helping for sale by owner home sellers, you can setup a free 14-day trial of CallAction.